Physics is the most fundamental of all sciences. It observes and explores the physical laws and principles that govern the nature of the universe. Physics research underpins many technological advances, from cancer treatments to electronic devices. It is a stimulating and inspiring discipline. We‘re top ten in the UK for Physics and Astronomy, according to The Times and The Sunday Times Good University Guide 2019. At Leeds, you’ll develop a thorough knowledge of core physics, from thermodynamics to quantum physics. You can also explore more advanced topics that relate to our research strengths, from astrophysics to nanoscale and biophysics. On this course, you’ll get involved in real research. It is possible to transfer to the 4-year integrated Masters (MPhys, BSc) course from this three-year Bachelor’s (BSc) degree up until the end of your second year, subject to suitable academic performance at that stage. This course is professionally accredited by the Institute of Physics, meaning the topics you’ll study reflect the latest developments in physics. By studying an accredited course, you'll gain the skills you’ll need to succeed in industry upon graduation. In the first two years of your degree, you’ll study core physics topics, including: mechanics, quantum physics, relativity, vibrations and waves, thermal physics, electromagnetism and solid state physics. You’ll also have the option to take modules offered by our research groups, such as astrophysics or nanophysics, or even ‘discovery modules’ from other departments. In your final year, your work will be closely linked to current research. We offer advanced modules on research topics such as: quantum photonics, bionanophysics, quantum mechanics, liquid crystals, cardiovascular medical imaging, and cosmology. Our students are also able to study higher level modules offered by the Department of Medical Physics, the School of Mathematics and the School of Philosophy, Religion and History of Science. For your final year project, you’ll work as part of an internationally recognised research team on an open-ended project. You’ll plan and organise your work, follow it through and present your results. This is a wonderful opportunity to take part and actually contribute to the latest physics research and join one of our research groups. You will be taught through several different teaching methods, including lectures, workshops, small-group tutorials, laboratory work, project work and computer-aided learning. In the first two years, the material you learn in lectures is supported by a mixture of small group tutorials and larger weekly workshops, where lecturers work with a team to improve your practical problem-solving skills. In later years, the lecturer will usually support their own specialist material through bi-weekly workshops. Laboratory classes are an integral part of our teaching throughout your time at Leeds. They provide you with the opportunity to develop your verbal and written communication skills through performing experiments individually, or as part of a group. You may also have the opportunity to undertake a short course on data analysis and statistics and learn how to conduct practical experiments in preparation for your final year research project. All students are assigned a personal tutor. Your personal tutor is there to offer advice, monitor your progress, and be your first point of contact during your undergraduate years. There are many facilities that will support your studies including extensive computer clusters. The School itself provides additional computing and study areas. The Edward Boyle Science and Engineering Library is only a short walk from the School of Physics and Astronomy and has multiple copies of the recommended books. It also has a variety of different studying environments, such as personal and flexible group work areas. You are assessed primarily through formal exams. Other methods include practical work, oral presentations, written reports and tutorial work. The variety of assessment allows you to develop a broad range of skills and demonstrate a variety of talents. Details on the types of assessment used for each module can be found on the University Module Catalogue. Excludes A Level General Studies and Critical Thinking. Where an A Level science subject is taken, we require a pass in the practical science element, alongside the achievement of the A Level at the stated grade. GCSE: C in English Language, or an equivalent English language qualification. BTEC qualifications in relevant disciplines are considered in combination with other qualifications including A Level Physics and Mathematics. D3 M2 M2 to include Physics and Mathematics. 35 points overall with 15 points at Higher Level to include 5 in Higher Level Physics and 5 in Higher Level Mathematics. H1 H1 H1 H1 H2 H2 at Higher Level including H1 in Mathematics and H1 in Physics. AAB including A in Physics and A in Mathematics at Advanced Higher Level. We accept a range of international equivalent qualifications. For more information please contact the School of Physics and Astronomy admissions team. The UK Government’s Foreign and Commonwealth Office (FCO) operates a scheme called the Academic Technology Approval Scheme (ATAS). If you are an international (non-EU/EEA or Swiss citizen) applicant and require a student visa to study in the UK then you will need an ATAS certificate to study this course at the University of Leeds. More information and details on how to apply for your ATAS certificate can be found at GOV.UK. Suitable applicants will be invited to an applicant day as this gives you the opportunity to meet our staff and students, explore the School and University and find out more about your course. If you have non-standard qualifications, or when there is no evidence of recent study of mathematics or physics, a 30-minute interview and/or a 90-minute test covering the A-Level syllabus may be part of the selection procedure. This is to ensure that the course is suitable for you and that your current studies have prepared you for the curriculum at Leeds. If you are unable to attend, a telephone or Skype interview may be arranged. For further information, read our admissions policy. The School of Physics and Astronomy offers a range of scholarships for Home, EU and International students. Physics graduates are in demand for some of the highest paid and most satisfying roles in employment. The numerical, analytical and problem-solving skills you will develop and your specialist subject knowledge are highly valued across sectors including aerospace, electronics, energy, environment, and transport. This course also allows you to develop the transferable skills that employers seek. One of the key features of this course is the final year research project, which is an opportunity to work with one of our internationally recognised research groups. This is an excellent opportunity to develop your independent research skills and teamwork abilities; it will prepare you for a career in research in both academia and industry. Almost a third of our students progress onto PhD study or other postgraduate qualifications. For further information on career paths and employability please see our careers pages. To learn about the careers of School of Physics and Astronomy alumni, see their profiles. Throughout your degree, we will make sure that you have the support and opportunity to develop the skills and experience you’ll need to make the most of your career choices. Our industrial placement scheme helps you gain valuable work experience that can help you stand out from the crowd. You could also secure a part-time job that you can feature on your CV through the Students’ Union's Joblink. We teach problem-solving and high level thinking at all stages of your degree. 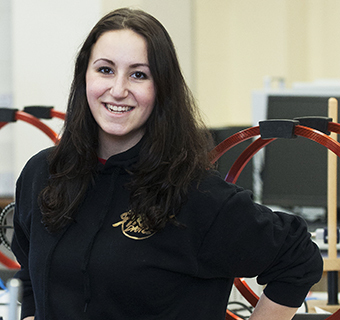 Our degrees allow you to develop the core subject knowledge and skills that you need to progress to a career – in whichever area of Physics you choose. We enable you to get involved with real physics research. On this course, taking a year abroad adds an additional year to your studies. During your year abroad, you will study physics at your host institution. An industrial placement will boost your self-confidence, not only in your chosen subject area but in the marketplace generally. The industrial placement (‘Year in Industry’) scheme gives you the opportunity to experience salaried work before you graduate. Employers actively seek graduates who already have work experience and it can make all the difference in interviews. On this course, your industrial placement adds an additional year to your studies. In addition, the opportunity to work every day with scientists who are experts in their field is an incredible opportunity to enhance your knowledge of physics. During your industrial placement, you will have an industrial supervisor from within the company, plus an academic supervisor who will keep in touch throughout your placement. Our students have the ability to apply for competitive funded Summer Scholarships at the end of year 2, which will provide 8 weeks paid employment actively pursuing research in Physics.